Trossachs champs again – Arthur Doyle. Arthur Doyle (Dooleys) underlined his superiority as Scotland’s short distance TT king, around the Tour de Trossachs 2009 on a glorious Sunday afternoon with a 96 second margin over Phil Brown (Velo Ecosse) to add the Scottish Olympic TT title to the 10 and 25 crowns which he already wears, and completing a second successful Trossachs campaign to follow last year’s decisive win. Meanwhile, Callum Wilkinson (Endura) hammered his road machine through it’s first time test of the year to the bronze medal. “Failte” says the sign – ‘welcome’ in the Gaelic language, pronounced ‘fail-chi’ – as you enter the Trossachs; all very well if you can climb, corner, descend, don’t mind rough road surfaces and still have the enthusiasm for an hour plus at big wattages. The sun was splitting the sky as I collected a start sheet at the Aberfoyle car park; it was surprising to see vets road race champ Stuart McGregor collecting his number, but he has a four day stage race in Mallorca coming up and needs to hang on to his form. I stopped to have a look at the memorial seat which has been placed near the top just as Peter Robertson (Forres) rode past – ‘when I were a lad,’ he was a top tester with the Central Scotland Wheelers. ‘Aye, right!‘ I acknowledged, this time – I had visions of the poor soul screaming, ‘twenty four’ all the way round the Trossachs! Over the top and Loch Drunkie was just as beautiful as last year; number 30 – Steve Nutley of Fife Cycling 2000 – swished past, looking the part and I had a mind to chase him for a closer look; but I was distracted by the view across Loch Achray to the Trossachs Hotel. Carlos Riis (Shetland) was the next man who was on top of the job – off 34 – I followed him for a little, just as he caught 32, who tried to lift it but very quickly went ‘rouge,’ as the French say. Graeme out for a potter. 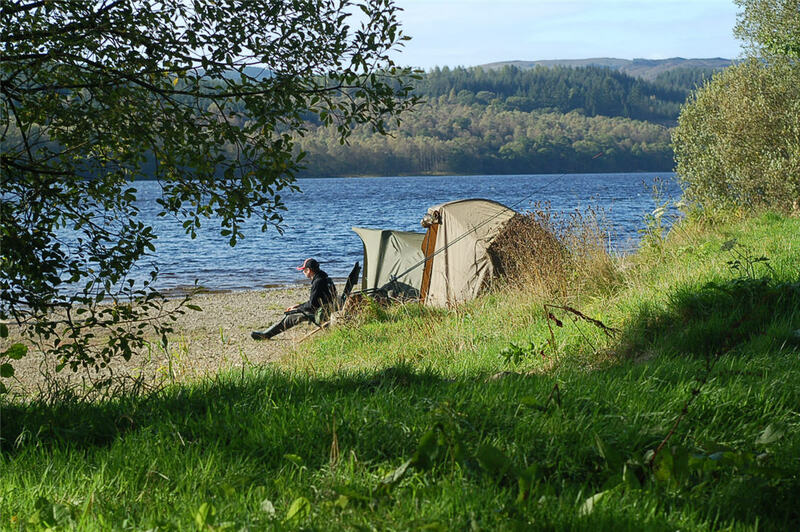 And the fishermen were still on Loch Venachar – maybe they’ve been there since last year? So were the sail boats, brilliant white in the sharp sunlight. We’ve spied the fishermen in the same spot for the last three editions of this race. The Inver Trossachs road was gnarly with the grit and leaves hard to see in the shadows. The long, gently rising heart straight out of Callander is a flyer if you’re strong – a heart breaker if you’re not. The climb over to Thornhill isn’t as hard as the old Braes of Greenock used to be, but there’s still a lot of gravity involved before the sweet drop to junction with the Trossachs road. But those last eight miles or so are tough; up, down, left, right, bad surfaces – another heart breaker if you’re not right on your game. Especially helpful, if you’re suffering, will be those mile marker count down boards. I passed Andy Torrance (Dooleys), Graeme Hatcher (Isle of Man) and Phil Brown as I did my second climb of the Dukes of the day and got up there in time to get the benefit of Mr. Russell’s time keeping. Phil Brown atop the Dukes. Phil Brown has been enjoying good time trial form this year and we thought he could win – he was the man we set the watch on. Hatcher was down 40 seconds; Torrance was down 12 but looking the part; Wilkinson was up 17 and looking very smooth on a high cadence; Joe Wilson (Sandy Wallace) was off the pace; so was Hugh Jamieson (Dooleys); Alistair Robinson (Endura) had almost caught Jamieson. Jim Cusick was a little down, but he’s not a man to under estimate; Doyle was level with Wilkinson on our watch but charging over the ridge. With two guys who would be right up there in the classement, Endura surprised me by not having a third man – back in the days of GS Modena, someone would have been dragged to the start to complete the trio. Back down off the Dukes and we took up position at the one mile to go board, just where it drags up to totally demoralise the weak – with a rising headwind adding to the misery. The Bicycleworks John Anderson was another giving it the ‘off duty pro training’ thing – but I think McGarrity just had the edge. Phil was hurting but his tyres were making the right noises. Not a good day for Gary Robson (Dooleys) – he’d been caught and dropped by Phil. Hatcher was looking the part but the watch didn’t think so – it said the same about Torrance, Wilkinson, Wilson and Robinson. Jas Cusick at a mile to go. But then the cruise missile form of Arturo homed into site – the loud ‘clack’ of an up-change on the drag emphasising his strength. Jim Cusick and Andy Torrance both succumbed to Arthur’s guidance system – we waited to take pics, and there were just the quotes to get. “I was feeling OK, I went for the prime on the Dukes but got baulked by a bus (Arthur just pipped him) but I knew I wouldn’t beat Arthur over the full distance. “I’ve signed with Endura for next year; this year has been an eye opener with riding the Premiers – specially the team tactics in those races. “I’m looking forward to next year, riding with guys like Rob Hayles – it’s a lot of responsibility. Callum at the top of the Dukes. 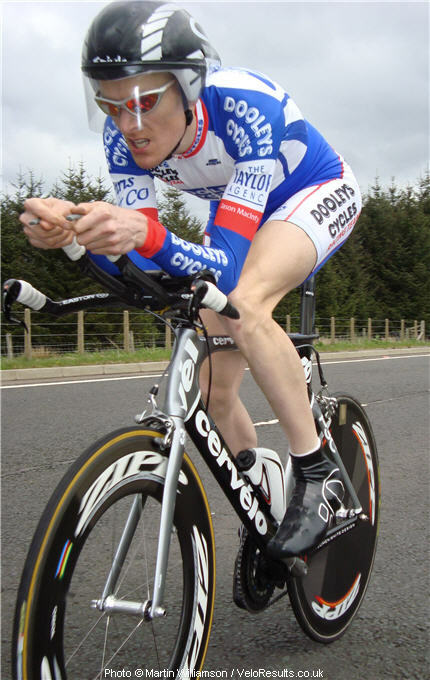 Paw Wilkinson pointed out that Callum was the only one of the big guns not on a time trial bike – hardly seems worth it, if he only rides one a year! 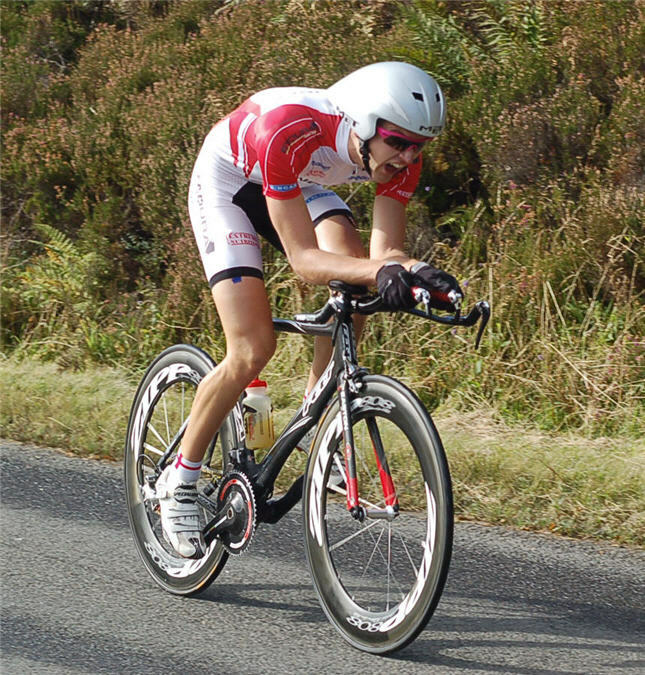 “I feel off my bike earlier in the year, breaking my ribs and wrist; jumping out of the saddle in road races was out of the question – but on a time trial bike you just hop on and point it, don’t you? “I’ve got a 54 for the ’25’; 1:51 for the ’50’ and 3:55 for the ‘100’ – I won’t be far away in the BAR but there’s Carlos and Jonathan Copp to think about. “Today was a good day for the course, but it was very tough on the run in from Thornhill; I was hanging on! “The two minute gaps make it hard as well, it’s tougher to catch guys. “This was certainly a target for me, yes. “I think this is the first time this year that I’ve got my peak right – at last! Arthur’s call to the podium meant the end of our interview; not to worry – great weather, good race, good winner, not much more you can ask for! Ciao from Benevento! To go in the "it's a small world" file - when we left you last night, we'd narrowly escaped running out of gas en route Sulmona. After a bit of messing around, we found the apartment; who answered the door?